‘The Namesake’ is the story of a boy brought up Indian in America. ‘When her grandmother learned of Ashima’s pregnancy, she was particularly thrilled at the prospect of naming the family’s first sahib. And so Ashima and Ashoke have agreed to put off the decision of what to name the baby until a letter comes…’ For now, the label on his hospital cot reads simply BABY BOY GANGULI. But as time passes and still no letter arrives from India, American bureaucracy takes over and demands that ‘baby boy Ganguli’ be given a name. In a panic, his father decides to nickname him ‘Gogol’ – after his favourite writer. Brought up as an Indian in suburban America, Gogol Ganguli soon finds himself itching to cast off his awkward name, just as he longs to leave behind the inherited values of his Bengali parents. And so he sets off on his own path through life, a path strewn with conflicting loyalties, love and loss…Spanning three decades and crossing continents, Jhumpa Lahiri’s much-anticipated first novel is a triumph of humane story-telling. 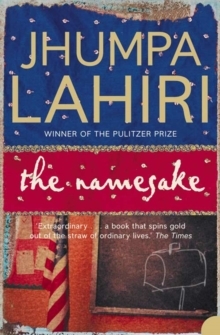 Elegant, subtle and moving, ‘The Namesake’ is for everyone who loved the clarity, sympathy and grace of Lahiri’s Pulitzer Prize-winning debut story collection, ‘Interpreter of Maladies’.